Health and fitness worksheets and activities. 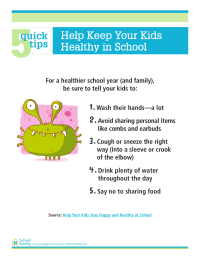 Help your kids practice health and fitness lessons with these fun printables. Most kids don’t get enough exercise during the school week. 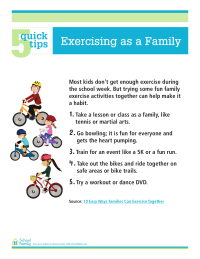 But trying some fun family exercise activities together can help make it a habit. 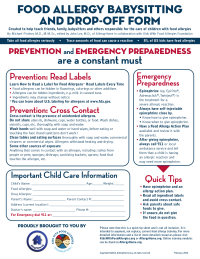 Print and complete this fill-in form when leaving your food-allergic child with a babysitter or dropping her off a friend's home, a grandparent's home, etc. 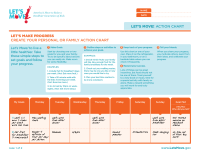 To set goals for your family’s physical activity, use this action chart as a goal tracker. (You can use the Let’s Move! Screen Time Log to track how much time everyone is spending in front of a screen.) Visit the Let’s Move! website for more information. To get a sense of what changes may need to be made in your household, keep track of your family’s screen time vs. active time. 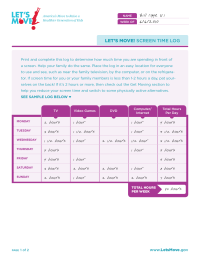 First, log how much time your family spends in front of a screen, including things like watching TV and movies, playing video games, and using the computer (outside of school or work). Then, look at how much time the family spends doing physical activities, such as walking, doing active chores, or playing sports together. If you see that your family logs more hours in front of the screen than being active, sit down together and set goals to increase your physical activity. The first page of the download shows a completed log as an example; an empty log for your family to fill out is on the second page. Visit the Let’s Move! website for more information.